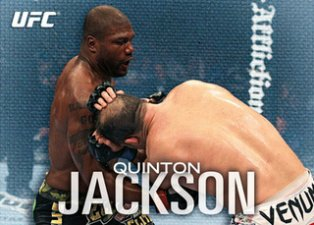 Good: You are guaranteed eight hits per 2012 Topps UFC Knockout box, which gives you a variety of autographs, relics and autographed relics. Autograph highlights include Arianny Celeste, Brock Lesnar, Anderson Silva, Georges St. Pierre, and Miesha Tate. Fisto-graphs have a great innovative design with a fighter's knuckles inked directly on the card. I love the design and overall look of the Triple Threads Autographed Relics, Three-of-a-Kind Triple Autographs, Full Contact Autographs, and SickSigs Autograph Book Card. Bad: Like all high-end products, the autographs and relics can be hit or miss. You get 40 cards per box, 24 of which are base cards. It takes more than four boxes to put together the full 100-card base set. I don't really like the base card designs. It seems very bland compared to past Topps UFC sets. More color would have been better. Perhaps Topps could have incorporated the Octagon cage as a border. Despite being on the autograph and relic checklists, Arianny Celeste and Miesha Tate don't have base cards. 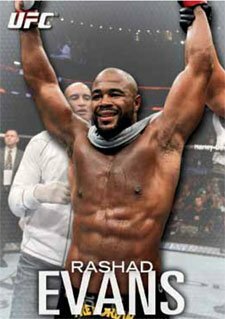 The Bottom Line: 2012 Topps UFC Knockout is a high-end MMA product that cost around $180 a box at release. 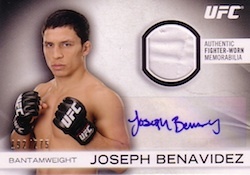 Even though the cost is high, the end results can be rewarding with so many autographs of top fighters. Each pack gives you one hit, one parallel card and three base cards. Even though you know every pack will have either an autograph or relic card, the excitement is still there as you wonder what the main card is. The base cards are made on thick stock cardboard. The majority of the cards showcase action shots, fighter poses or victory celebrations. The background is greyish color, which puts the emphasis on the fighter. The fighter's first and last name are at the bottom center of the card. Missing on the card front is the weight class. The back of the cards lack fighter information and win-loss records. There are five different parallels: Gold, Silver, Green, Red, and Mat Stock. They are difficult to distinguish at first glance unless you have two cards side by side to compare them. The Fight Mat Relics have a swatch of the actual mat, which is bordered around an octagon. The Fighter Gear Relics have a simple solid-looking design behind a plain silver background. The Premium Pieces Relics have multi-colored, fighter-worn memorabilia swatches. The Triple Thread Relics are the nicest looking cards in this product. I have loved the design since Topps first produced them. 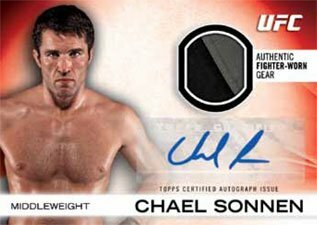 Fighter Autographs are essentially the base card with an on-card signature. 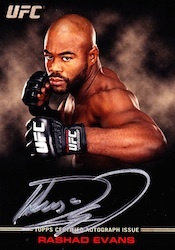 Full Contact Autographs have a sharp-looking black background with a nice silver signature on the card. The Notable Nicknames Autographs have sticker autographs with the fighter's nickname penned on it. The Three-of-a-Kind Triple Autographs look amazing, despite their use of sticker autographs. The Fist-ographs are a hobby first. They have the knuckles of the fighter actually imprinted on the card. All of the autographed relics are unfortunately sticker autographs, but they still look amazing. 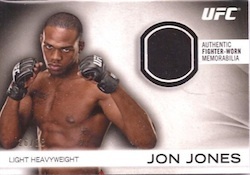 The base set is composed of 100 cards, which is a lot smaller than Topps' past UFC releases. There is a nice mixture of current fighters, MMA legends and rising rookies. We get the first UFC-produced card of Heavyweight contender Alistair Overeem. 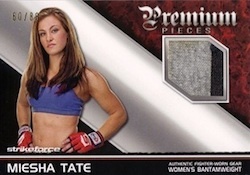 There are no base cards of the Octagon Girls or female Strikeforce fighters. 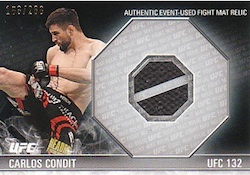 With each new Topps UFC Product, they have to balance who to include in the set from their ever-expanding UFC roster. 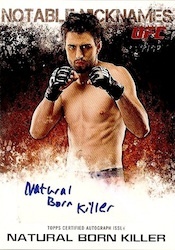 One highlight of 2012 Topps UFC Knockout is that the majority of the UFC's top stars have autographs. These include Jose Aldo, Arianny Celeste, Urijah Faber, Matt Hughes, Jon Jones, Brock Lesnar, Tito Ortiz, BJ Penn, Anderson Silva, Georges St. Pierre, Miesha Tate, and Cain Velasquez. Each box of 2012 Topps UFC Knockout has eight packs of five cards. You are guaranteed eight hits, including two autographed relics, two autographs and four relics. You also get one parallel card per pack. Considering this is a high-end box, there is a lot of risk involved. It has a huge upside if you are willing to take the chance. 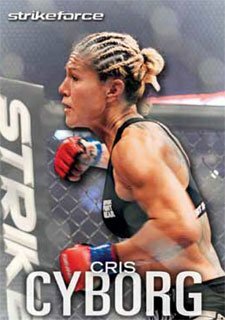 Topps has made a great UFC product, introducing different designs and innovations.There are enough nice looking card designs in 2012 Topps UFC Knockout to appeal to MMA collectors of all ages. The Topps Triple Threads Relics especially stand out. Each pack comes with the same excitement since you know you are going to get a hit. Even though the base card design is lacking, the autographs and relics more than make up for it. 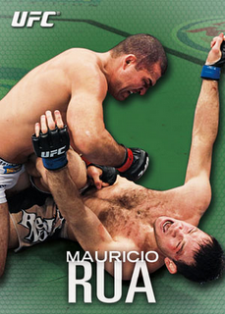 The hobby-exclusive 2012 Topps UFC Knockout promises a variety of high-end hits. Offering either an autographed relic, autograph or relic card in every pack, highlights include Triple Threads autographs, Sicksigs book cards featuring six autographs and on-card silver Full Contact Autographs. The Octagon girls get in on the action with Between Rounds relics and autographed relics. The most high-profile new innovation are the Fist-ograph box toppers. 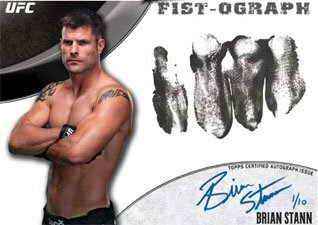 The randomly inserted over-sized bonus cards include both a fist print and an autograph from the featured fighter. 100-card base set combines current fighters, retired legends, Strikeforce fighters and rookies. Base set parallels (inserted one per pack): Gold (numbered), Silver (/188), Green (/88), Red (/8), Mat (/1) features a simulated mat card stock, Printing Plates. 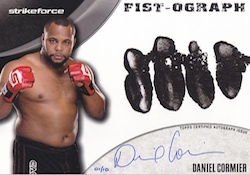 New over-sized Fist-ograph box toppers (ten cards, /5) have fighters add their fist-prints to the cards. Also autographed, the checklist includes both UFC and Strikeforce fighters. Double-sided Dual Autographed Fight Mat Relics (ten cards, /10) mix the autographs of two opponents with a mat piece. Autographed Fighter Relics (35 cards) come with the following parallels: Green (/88), Red (/8) and Mat (/1). Autographed Premium Pieces (50 cards, /50) include both a signature and a multi-colored swatch. The Octagon girls are the focus of Between Rounds Autographed Relics (/8). The cards feature a piece of their clothing, robe, round cards and an autograph. 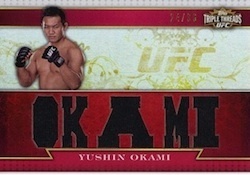 The popular Triple Threads brand carries over to UFC with Triple Threads Autographed Relics (24 cards, /18). Each card has three memorabilia pieces displayed in custom die-cut windows. Parallels: Gold (/9), Sapphire (/3), Platinum (/1), Leather (/1), White Whale Printing Plates. Fighter Autographs (50 cards, numbered). First-time signers have a "First Autograph Issue" foil stamp. Parallels: Red (/8), Mat (/1). 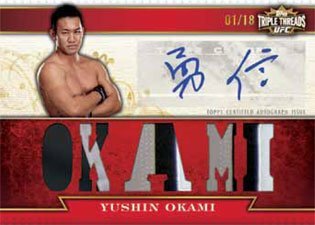 Notable Nicknames (20 cards, /25) have fighters inscribe their nicknames. Thirty-five fighters will have similar cards in Fighter Red Ink Nickname Autographs (/15). 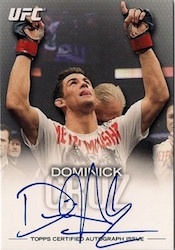 Full Contact Autographs (20 cards, /99) have on-card silver signatures. Three of a Kind Autographs (ten cards, /10) feature three signers with some sort of connection. SickSigs (six cards, /5) book cards have six autographs. A total of 80 redemption cards will be inserted across the product good for an autographed fighter glove. Forty signers are signing two gloves each. Fight Mat Relics (29 cards, /288) include mats from matches where they were featured combatants. Parallels: Silver (/188), Green (/88, multi-colored swatch), Red (/8, jumbo swatch), Mat (/1, jumbo multi-color swatch). Fighter Gear Relics (35 cards, /299) include pieces of event-worn shirt and shorts. Premium Pieces Relics (35 cards, /99) are highlighted by multi-colored swatches. Octagon girls return with Between Round Relics (/25), which feature three memorabilia pieces: outfit, robe and round cards. Triple Threads Relics (24 cards, /36). Parallels: Sepia (/27), Emerald (/18), Gold (/9), Sapphire (/3), Platinum (/1). Three fighters are included on each Triple Threads Relic Combos (12 cards, /36). Parallels: Sepia (/27), Emerald (/18), Gold (/9), Sapphire (/3), Platinum (/1). Triple Threads Double Combos (six cards, /36) book cards include relics from six different fighters. Parallels: Sepia (/27), Emerald (/18), Gold (/9), Sapphire (/3), Platinum (/1).